I really wanted a full ensemble of crusties but not knowing when or if I may have the opportunity to photograph a group, I present you with a lone crustie girl. I did actually have opportunity some time ago for group shots, but a photographer friend and I both found them rather menacing and we were unsure as to the reaction we would get if we fired away with professional looking photo equipment. So we abstained. However, since that time I have been yearning to capture crusties for this blog. 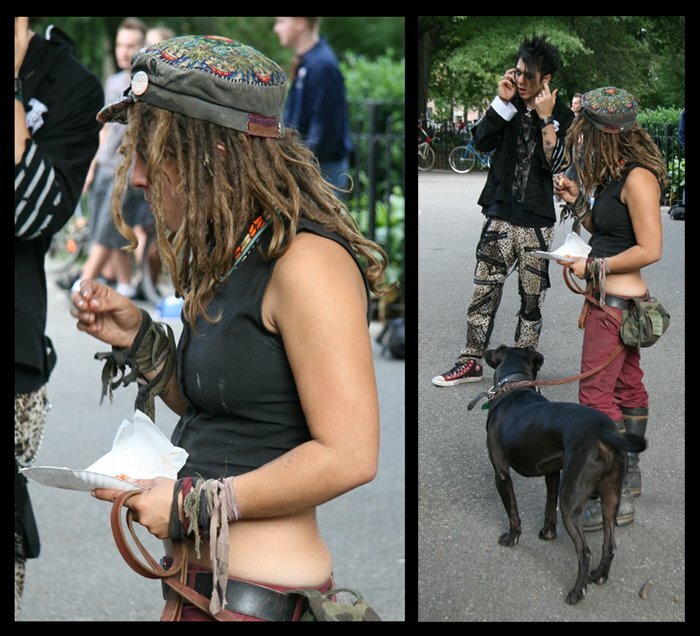 The woman in this posting was photographed in Tompkins Square Park where groups of crusties can sometimes be found. What is a crustie? A contemporary nomadic bohemian. Anti-authority with varying politically nihilistic values such as anti-work, anti-government, anti-war, anti-religion, anti-vivisection, anti-civilization. Of course there have been many other subcultures that loosely fit this definition such as hippies, with whom crusties have much in common. Fundamentally homeless, crusties survive using various means such as dumpster diving and begging. They are sometimes associated with crust punk (or crustcore), originally known as Stenchcore, founded by the bands Amebix and Anitisect in Britain in the 1980s. In the USA, crust punk began in NYC with Nausea from the Lower East Side.